Relatively recently I experienced "Painting Canada" which was an exhibition of seven landscape painting pioneers who were active in Canada in the 1920s. The paintings are an extraordinary glimpse into the wildness and wilderness of Canada at a time when humans had made very little damaging impact, but actually much of the beauty and wildness that they put onto canvas still exists today in many places. The group of seven artists are sometimes known as the Algonquin School because they painted some of their best works in the Algonquin national park. They should really have been a group of eight artists except that the artist who most inspired them, Tom Thomson, went missing in a mysterious incident with a canoe by a lake, leaving the others as the "group of seven": Franklin Carmichael, Lawren Harris, AY Jackson, Arthur Lismer, Franz Johnston, JEH MacDonald and Frederick Varley. I mention all their names because putting any of these into a search of Google images will show an instant gallery of the works of each of them. They painted mostly as if people didn't exist concentrating on what nature had to offer and they wanted to capture the wildness of Canada while they could. In the days before motor cars were commonplace they typically reached their subject matter by rail. They converted a railway wagon into a studio and living accommodation and would get a train driver to drop them off in a remote siding where they would paint for several days before signalling to a passing train to stop and connect up their wagon for the return journey. They captured lakes, mountains, wilderness and even a collection of icebergs, which were a favourite of Lawren Harris. 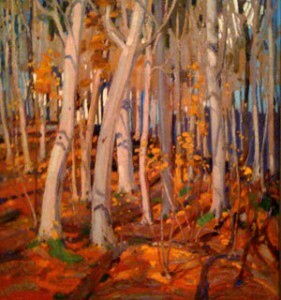 Woodland painting is a strong theme of these Canadian artists and they painted many birch forests and depicted the magnificent autumnal colours of "the Fall" for which Canada is famous. The picture here is one I took, of a Tom Thomson painting, just before the security guards at Dulwich Picture Gallery ran over and told me rather firmly that I wasn't supposed to take any pictures! I was tempted to tell them that I felt compelled to catch the image as the artists themselves had been. The colours in this picture here are typical of all these artists - extremely bright and contrasting: some of the pictures make you wonder whether such colours really exist in nature but I visited with a group of North Americans who assured me that such colours are true to life. Some of the windswept wilderness paintings are so raw that they make you shiver. Many people who buy woodlands are moved to paint, draw or photograph them: the sheer beauty of nature makes us want to capture it and study it. Many owners of small woods have created websites which include portrayals of the wildness of their woodlands. One of the pleasures of painting or drawing in your woodland is to catch the same scene in different seasons. Of course you don't need to own a woodland to paint it and ownership may have been the furthest thing from the minds of the "group of seven" portrait pioneers: however ownership does at least mean you are likely to return to the same scenes, and painting your own wood is a way of sharing and appreciating it. Anyway, if you are thinking of doing some woodland paintings, have a look at these Canadians for inspiration! more woodland art work can be viewed on my website.